With a sleek design, large work surface and room to spread out, the Bush Furniture Buena Vista Writing Desk in Madison Cherry works perfectly in your family room or home office. 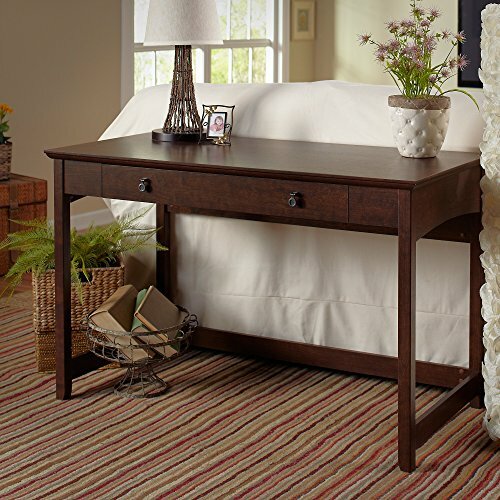 The Writing Desk boasts a durable top, elegant post-leg design and curved base rails, all accented by Aged Bronze hardware for a comfortable design to fit most decor. A pull-out charging and storage area with flip-down drawer front works perfectly as a keyboard or laptop tray. Spacious, recessed underside rails provide lots of legroom, so surf the net, pay bills or do your homework in comfort. The generous work surface and small footprint allow room-placement flexibility. Height is ideal as either a sofa table or stand-alone desk. Solidly constructed and versatile, beveled top edge and side rail curves are classic and contemporary. Matches the design of other pieces in the Buena Vista Collection. Backed by the Bush Furniture 1 Year Manufacturer's Warranty. See the full collection for coordinating items available.